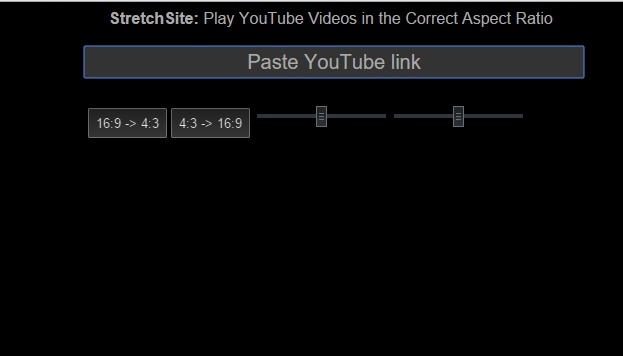 StretchSite is a new web application that lets you play any YouTube video in your desired aspect ratio. The process is very useful and extremely simple to use. All you need to do is copy and paste the YouTube link in the space provided. As soon as you do it the video starts playing. Just below the address bar, there are two sliders that you can stretch from 4:3 to 16:9. The video can be minimized or maximized in any way you want and it actually improves the video quality in case you are not being able to watch it in HD mode. It’s true that the videos played via StretchSite does not show the same quality as that of HD videos of YouTube, but it can be a good standby if your internet connection too slow to support high definition videos. You can minimize the dimensions and even watch videos in vine like Format. The best part of the app is that there is no unnecessary hazard, no difficulty in embedding the videos.